Dietary and behavioral modifications have resulted in limited long-term success in curing morbidly obese patients, and surgery remains the only effective treatment. Of the surgical procedures that are the most commonly offered, Roux-en-Y gastric bypass (RYGB) appears to offer the best long-term results. However 5–15% of patients will not achieve successful weight loss after RYGB. There are many reports showing that the patients who underwent gastric bypass surgeries regain weight over time. The cause for this remains unclear. Several factors may contribute, including dilation of the gastric pouch and the gastrojejunal anastomosis. However, the data to support the link is sparse. 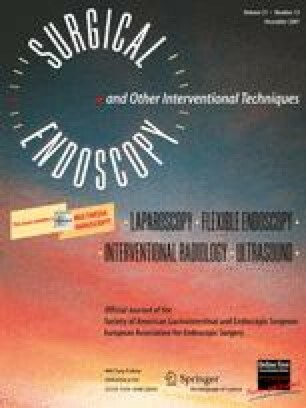 The objective of this paper is to describe the surgical technique of wrapping the gastric pouch with a polytetrafluoroethylene (PTFE) mesh to prevent gastric pouch dilatation. In specific, we created a 20–30 ml gastric pouch and subsequently, the gastrojejunostomy was performed with a circular stapler. Afterwards, the mesentery was dissected and the gastric pouch was wrapped with the PTFE mesh. We have performed this procedure on three cadavers with an average operative time of 75 minutes. We found that the procedure of wrapping the gastric pouch was not particularly difficult. As a result, the gastric pouch, gastrojejunal anastomosis and the stump of the jejunum are all totally wrapped within the mesh. It may be effective in the prevention of dilatation.